KANSAS CITY, Mo. — Kansas City police are implementing a new crime prevention strategy that will have officers taking a closer look at their surroundings. Kansas City residents might be familiar with "hotspot policing," a strategy where law enforcement identifies a high-crime location and saturate it with resource. 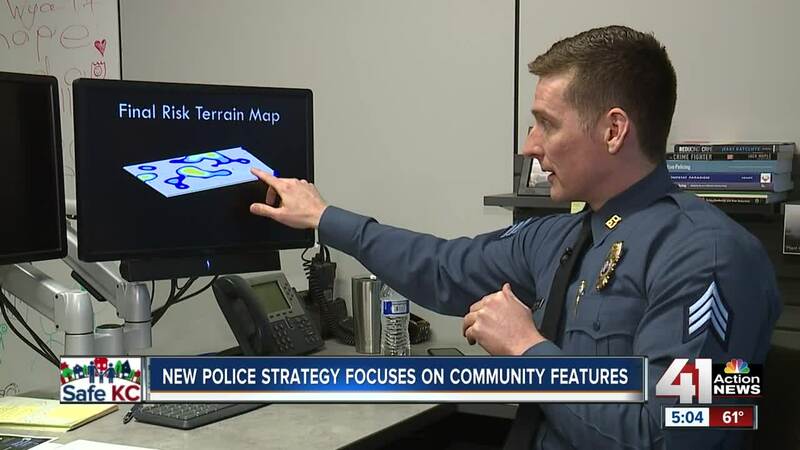 However, the new strategy, using "risk-terrain modeling", is about trying to change the environment so that crime is less likely to happen in the future. "You could have the same crime problem in different parts of the city, but what drives that crime could be completely different," KCPD Sgt. Jonas Baughman said. Baughman has made a career out of analyzing crime data. Almost a decade ago, he became intrigued with the work of Joel Caplan and Leslie Kennedy, professors from Rutgers University in New Jersey. "Instead of looking at where crimes have occurred or crime data, we're taking a look at environmental features of neighborhoods and larger areas throughout the city," Baughman said. Using a geographic information system, police can explore the relationship between crime and locations such as liquor stores, convenience stores and bus stops. The software can generate a heat map that indicates where law enforcement should devote more resources to. Resources may mean an officer on patrol notices that a bus stop lacks enough lighting and brings it to someone's attention. As result, it could prevent a mugging. "It's good for the community, and I think everybody would be safer, we'll feel safer in the community," Brian Upshaw, a bus rider, said. Through a grant, KCPD used the model within their Metro Patrol Division in 2012-2013. Within three months, they saw a 12 percent drop in shootings and armed robberies. Since then the model has evolved. KCPD Chief Rick Smith unveiled the "Risk-Based Policing" strategy at Tuesday's Board of Police Commissioners meeting. "This is all about opening up information for our officers so they have a chance to work on it," Smith said. Baughman presented the strategy and took questions. "We don't have to rely on arrest data, crime data--police data to sum it up; Whatever we can bring in, it's easy to sustain and create new models," Baughman said. "It's very, very cost effective as we can work with existing tools." Commanders at KCPD have undergone training on the new strategy. Models are currently being built. Those will be distributed out in the next few weeks. The hope is by next month they'll be talking about this new strategy at the chief's weekly crime meetings.